Android is king again. This year's Gartner's report says this. Android‘s overall smartphone market share has jumped to 72.4% in Q3 2012, up from 52.5% in the same period last year. Apple has got reduction. Its smartphone OS, iOS has fall down from 15% to 13.9%. Microsoft is again struggling at the bottom, its Windows Phone managed to grow from 1.5% to 2.4%. Another player, Samsung’s Bada managed to increase its market share, from 1.5% to 2.4%. 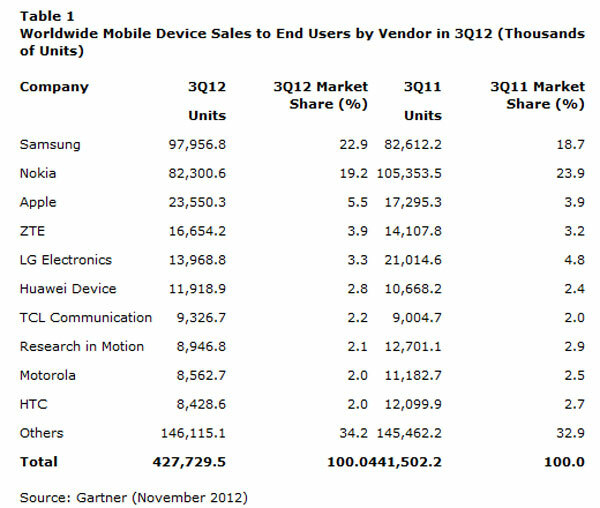 But when talk comes to sales of devices, there is the king: Samsung. 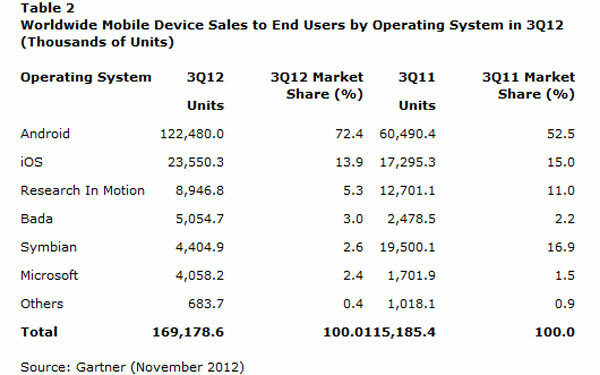 Samsung sold 97,956 devices in 3Q 2012 and secured 22.9% market share, while last year it was 18.7% with sales of 82,612 devices. A few time ago, samsung announced that 30 million units of Galaxy SIII have been sold. Nokia is on the second place holding 19.2% of the market share while Apple is on third with 5.5% of market share. Other figures are as follows.